One: What were some of your favorite memories within your business that happened in 2017, and what did you enjoy doing the most this year? It’s important to reflect on your favorite memories - what happened that you are still smiling about, what are things that made you happy and proud to be a business owner for your specific business? It doesn’t matter if you did it only a handful times or every single day. When you look back at your day to day within your business, what did you enjoy the most? Two: On the flipside, what were some of your not so favorite memories, and what did you enjoy the least? Perhaps it was something that led to a customer being unsatisfied, or how the holidays came around and instead of having everything planned in time, you felt disappointed in things. Look at these as “blessons”, or lessons that you learned that you can turn into blessings, because you learned from them and are thus able to build a better business from them.Perhaps it’s organizing your finances (I believe quite a few of us fall into this category) or you didn’t enjoy bringing packages to the post office. What did you do within your business that you dreaded, or avoided doing because you simply didn’t like doing it? Three: What is weighing the heaviest on your heart when it comes to your business? Answer this question honestly. Are you spread too thin? Do you have too many things going on and not enough white space? Are you worried about financially where things are? Or, are you in a pretty good spot? If you chose to let something go and stop doing something in your business, what would it be? Four: What brings you the most joy within your business? The answer here may surprise you. Think on it, don’t try to answer it quickly, but rather ponder it for a while. Is it hearing a thank you from a client when they purchased something from you, or perhaps tying orders with a beautiful silk bow before you ship them out? Is it connecting with people on a personal level, knowing that something you created is making a difference in their life, or something else that especially pertains to your niche? Five: When it comes to your goals, how did it go? Did you write them down and refer to them throughout the year? Or, did you simply say you wanted to do them, but find that you didn't make an accomplishment with them? What could you do differently next year? In addition, how many of those goals did you meet? Did you create too many goals for yourself, or not enough? Did you set the bar high enough, or do you think you could make them even stronger for the next year? Six: What did your clients and customers say about your business this year? Did you send out any client review requests, or did you send a survey out to your customers asking them their opinions? What can you improve upon, what would they like to see more of? It is vital to ask your clients what they would want. This not only fosters the relationship with them, it also may bring some things to light that you hadn’t thought about, or opens things in a different light. It may be that something you thought they would love, they aren’t so keen on. Or, something you didn’t think much of was an amazing asset to your business. By surveying your audience and asking their opinions, they’ll feel more connected with you. Take the time to do this with them to help your business to grow in the next year. Seven: What brought in the most money for your business, and what did not? It’s important to review the money aspect because you have to price things in a way that makes your business profitable. You have to review every single aspect of your business, and the money part is a big one. Just because you can make something, doesn’t mean you need to. If it’s a top seller, what can you do to it to enhance it even more? If it didn’t sell so well and you want to keep it as a product or service, what can you potentially change to help it to improve? Or, do you just need to let it go? Eight: Did you do any collaborations? If you did, which collaborations did you love and would you want to do more of? If you didn't do any, why didn't you? Additionally, is there another business you would like to do a collaboration with next year? In our industry, it is very easy to learn about new people both through others and online. Could you potentially add to those relationships and create something that will benefit the two of you, while strengthening relationships with people in your niche as well? Nine: What could you outsource next year? It is important to outsource things so that you can spend your time doing things you love the most. This doesn't necessarily have to be business related - it could be hiring someone to come and clean your home so that you don't have to spend your weekends cleaning. Before you become overwhelmed, begin actively looking for someone you can bring on to help you to run your business. Even if it's on a small scale - hiring a social media manager or a virtual assistant can be a tremendous blessing, and building a team can help both you and your business to grow well. Ten: What is the purpose of your business now, in comparison to January? Sometimes, our businesses and our path will change. This is a very normal thing - as our businesses grow and we spend more time on them, we learn that perhaps something we thought was the right direction may not be. Alternatively, something that we may have done on a smaller scale is becoming full focus. This sometimes requires a pivot within our business. Moving forward, if this is the case for you, it's important to make sure that everything you have available within your business aligns with this purpose to maintain clear messaging for your brand moving forward. Do you feel that what you're offering and creating now is fulfilling the purpose of your business? Or, do you need to make some changes? Look at your offerings with a fine-tooth comb. It may be time to let some things go or create something new to align with your business' purpose. Eleven: What is happening outside of your business right now? Is your business supporting your life, or is your life supporting your business? If your business has taken over your life, take the steps to take your life back. This may seem silly to say but seriously - think about your relationships, your home, your family. How often has work spilled into your personal time, and how often have you not set boundaries for yourself? How many times have you said "I have to do just one more thing." and that one more thing has taken hours, not minutes? It is so important that we take care of ourselves and those around us outside of our business. This means giving yourself grace and the space needed to love on your life outside of your business too. This also includes relationships with fellow creatives. How often have you met with or spoken to people other than through typing back and forth on a screen? Could you improve those relationships next year, and build upon face to face meetings as well? If you want to get to know someone that's across the country, can you schedule a virtual coffee date with each other, where you can see each other's faces, and build a relationship that way? Twelve: How are you really doing right now? This one is really important. How well did you take care of yourself this year, and how much sleep did you get each night? I ask this question because this time of year, a lot of us are tired, run down, and exhausted. Self care has flown out the window because this is the time of year, especially in December, we are taking care of a lot of other people and a lot of added things. I have this one last intentionally - because even though you are taking care of business on a daily basis, you have got to take care of yourself too. As the old saying goes, an empty well can not pour into others. If this is something you struggled with this year, how can you change for next year? What can you do differently so that you are filling your own cup on a continual basis, rather than not taking care of yourself so that you get to the point of being burnt out and simply tired? 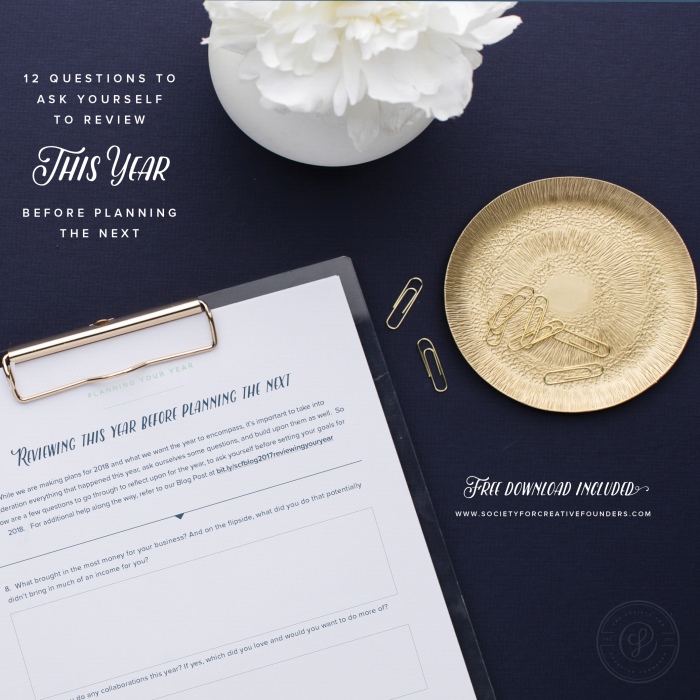 With these questions in mind, think about how you want to build your next year within your business. What can you add to your business to make it better, or what can you scale back on that you know is taking a lot of time and energy? Looking ahead to next year, summarize below what you want your business and your life outside of your business to encompass more of. After you have done this, keep those thoughts in mind as you begin planning for the next year, and refer back to them often.I know that similar to our post last week when we talked about reflecting about Black Friday - Cyber Monday sales, and this is a lot to take in in one setting, for one blog post in particular. So, we’ve created a free download for you, that is available within our Community for all of our Basic Members. If you would like to have a printable version of this, simply create an account at the Basic Level and access it here (enrollment is open for our Community until 10pm CST on Friday, 12/8!). Or, join us at the Advanced Level for even more of a community building experience for the year. We’ll be going over these answers in more detail in the Community in the weeks ahead, as we close out 2017 and begin planning for 2018 fresh. We’ve included spacious amounts of room for each question so that you can write things down, and left it unlined so that you don’t have to feel confined to writing things neatly. We would highly encourage you to print this out, take some quiet time to fill it out and then use it to guide you as you make your plans for 2018.We hope this post today was helpful for you. We’d love to hear from you, so leave a comment below letting us know what something you found interesting that you discovered along the way!